Japan suffered minimal losses including 30 aircraft, 5 midget submarines, and less than 100 men. Believing they had rendered the United States impotent, Japan continued their military assault with attacks on Malaya, Hong Kong, Guam, the Philippine Islands, Wake Island and Midway Island within a 24-hour period. What Japan did not realize was even though they administered a severe blow to the United States, they did not achieve a knock out. Their victory would be short lived. The Japanese destroyed dry docks and airfields, but they neglected to inflict any sort of damage to key elements of the U.S. Navy. The heart of the United States Navy was her aircraft carriers. 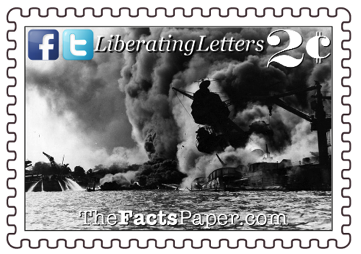 The Pacific Fleet’s three carriers were all absent from Pearl Harbor on the day of the attack. This meant they were ready and prepared to take on Japan immediately. They would inflict their revenge against Japan six months later at the Battle of Midway. Also untouched were the oil storage depots, Navy repair shops, shipyards, submarine docks and an old headquarters building. All of these facilities gave the United States ample means to recover and repair the damaged vessels and engage Japan in war within months instead of years. Due to America’s resolve and their damage to Japan’s forces during their second wave attack, their third wave plan was abandoned. This alone could have been the saving grace for the priceless facilities needed for a speedy U.S. recovery. He thusly called on Congress to declare war on Japan, which both the House and Senate promptly did with only one dissenting vote. Representative Jeannette Rankin of Montana was a devout pacifist. According to Rankin, "As a woman, I can’t go to war, and I refuse to send anyone else.” She also voted against entering World War I. Three days later, Germany and Italy declared war on the United States. In 1940, these two countries entered into the Tripartite Pact with Japan, which pledged these three countries “to assist one another with all political, economic and military means”. The United States promptly reciprocated. Thus the world was at war yet again. Liberty, it is heartbreaking to see the hatred, death and destruction humans inflict on each other. Whether it's an unfounded offensive strike or justified defense, this is not what God designed us for. Because of the blood of Christ, we can find comfort in the fact that we are in this world, but not of this world. When Christ returns, so will the perfect utopia God created in the Garden of Eden. So while we mourn for those who needlessly lost their lives in Pearl Harbor, as well as every other battle fought, we can rejoice that are brothers and sisters in Christ will rise when Jesus returns. We will then all live for eternity with our Heavenly Father, never to suffer pain, war or loss again. As the Japanese planes raced towards Pearl Harbor, unsuspecting servicemen busied themselves with breakfast and preparing for church. No one anticipated the life-changing event about to happen. After Japan declared war on China in 1937, the United States tried to reel them in with sanctions and trade embargoes. The two countries spent months negotiation and talking. No one in America knew Japan terminated those discussions until that fateful morning of December 7, 1941. The White House and Americans expected a military conflict with Japan for some time, but an attack on Hawaii was a complete surprise. Due to geography, U.S. military leaders largely dismissed an attack on American soil. America and Japan both stood firm during their talks, yet there was no indication that Japan was ready for war. Admiral Yamamoto intended for his planes to start their assault 30 minutes after their Ambassador informed the U.S. the peace talks had ended. However, the White House did not get the message until hours after the December 7th attack. In fact, Japan did not officially declare war until the day after the onslaught. Japan wanted to dominate Southeast Asia. They realized any attacks, especially in British territories, would receive a military response from the United States. The first goal in their plan required the crippling of America’s Pacific Fleet. Without the means to fight back, the Japanese would have years to invade their desired regions while America rebuilt their Navy. Six Japanese aircraft carriers departed for Hawaii on November 26, 1941. Two attack waves were outlined using 408 total aircraft. The first wave targeted battleships and airfields. The second wave went after carriers, cruisers, and shipyards. As hundreds of Japanese planes approached Pearl Harbor, two Army radar operators detected the approaching planes. The junior officer they contacted brushed off their warning due to an expected American fleet of B-17 planes to the island that morning. Fifty-three minutes later, Japanese commander Mitsuo Fuchida delivered the battle cry, “Tora! Tora! Tora!” ("Tiger! Tiger! Tiger!) and the fight was on. Since the Americans assumed an island attack was impossible, and war had not been declared yet, no precautions were taken. Parked planes set wingtip to wingtip. According to peacetime regulations, ammunition boxes were locked instead of open at the ready. No one had been assigned to man the anti-aircraft guns either. Despite being caught off guard, servicemen jumped into action and courageously fought back, especially during the second wave. Hundreds lost their lives or were wounded for their gallantry. Within 90 minutes, America suffered the loss of 2,335 servicemen and 68 civilians. The wounded numbered 1,178. More than 200 aircraft were destroyed. Five battleships sunk or capsized with three receiving heavy damage. Three cruisers, four destroyers and six other ships were also damaged or sunk. Most of these ships were recovered, repaired and returned to service. Two vessels continue to rest at the bottom of the harbor. The USS Utah capsized during the attack after being hit by two torpedoes. Most of the sailors swam to safety while 64 remained trapped on board. The Navy attempted to raise the ship but were unsuccessful. Some of her equipment was salvaged but her structure remains in Pearl Harbor. The USS Arizona was the most fatal loss of all. Four armor-piercing bombs struck the Arizona, causing it to explode. Sailors burned as the ship sunk within nine minutes. Only 335 sailors and Marines out of the 1,512 on board escaped the floating inferno. Many traversed hand-over-hand on a rope tied to the USS Vestal. The remaining 1,177 crewmen, which accounts for about half of the casualties on December 7th, perished on board. Much of the superstructure of the USS Arizona was also savaged. Both Presidents Dwight D. Eisenhower and John F. Kennedy worked on legislation to deem the wreckage a national shrine, which passed in 1962. A memorial was constructed over the remains of the USS Arizona where visitors travel by boat to pay their respects.